I have been selling digital sewing patterns since years and never have come across this valuable information until recently. I was surprised that Paypal has this kind of feature so I searched under “fees” and there it was! Are you ready to start saving some money and start paying lower paypal fees? Let’s do this! Micropayments are payments that are less than $10.00 per transaction. 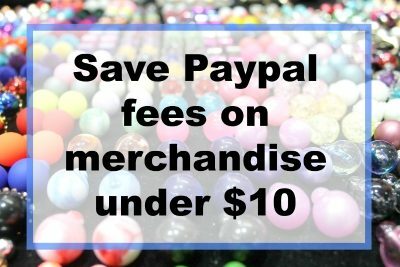 Paypal offers lower fees if your transactions are less than $10.00 meaning if you sell patterns (and especially digitally patterns where no shipping is involved) that are less than $10.00 in total transaction you can save money that way. How? With Paypal’s “5% plus $0.05” rate. 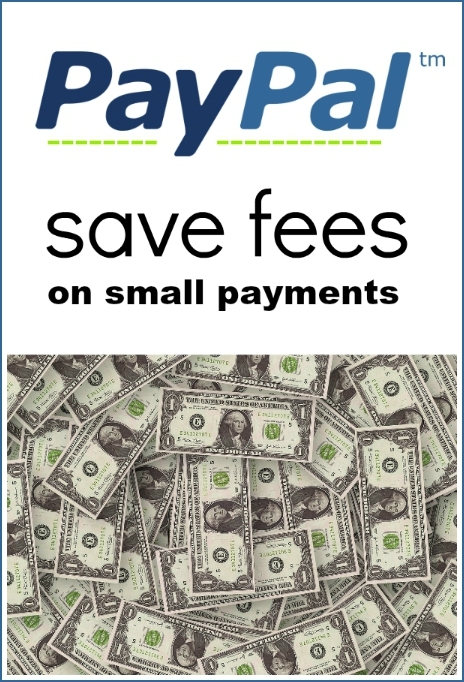 Here’s an example from the paypal site for a business that usually accepts $2.00 payments. Typically digital patterns range anywhere from $2.00-$9.99 (in the ideal case) and will be eligible for this low rate. If a pattern sells for more than $10.00 then Paypal automatically adjusts the rate to the usual 2.9% + $0.30 per transaction which most of us are (or were) used to anyways. More information on how to set this up in your paypal account can be found HERE! Note: I hired a web developer through Fiverr.com to help m set this up in my paypal account. The only thing is that your fees of 5% and 5cents will remain throughout, no matter if a payment will be over $10.00. You will end up paying a bit more fees if that’s the case but if your sales are under $10.00 for the majority then you will save in the long run. It’s very simple! You call customer service! Let me tell, I had to speak with them on numerous occasions and must say, they are a knowledgeable bunch! All you want to do is log into your Paypal account and scroll down to the bottom of the page. I usually get a passcode for a quick line and it has always worked great! Just ask for “payments & transactions” and a live person will be with you shortly. Disclaimer: I am not a web developer nor a Paypal specialist and definite information on switching to lower fees will be solely up to the Paypal representative. Thank you so much for this information, visiting from Rattlebridge Farms. I just got off the phone with Paypal and it was as easy as you said. As a new pattern designer with digital quilt patterns, I have been taking it in the teeth with seller fees. I wish I had known about this years ago! Thank you!! Yay! I am so happy to hear that you were able to set this up so quickly as well!! If you like come and check out our pattern shop where many patterns from various designers get sold! Just click on the top tab “vendor info”. One small correction – Paypal just told me that once you sign up for micropayments, ALL of your transactions are calculated at that rate, so if you start selling higher total transaction amounts, you’ll want to change back to keep your fees down. That’s interesting! They told me that the percentage adjusts once it’s over $10.00. I will call them tomorrow to ask again and will update this post. Thanks for stopping by!! Paypal told me that all payments under $10 would be at the micro rate, and only the payments above that would automatically be calculated at the old rate. In essence, my account has two rates, depending on the size of the sale. They really are interested in helping you pay as little as possible so you’ll use their service. I am thrilled! So glad you were able to take advantage of this!! Thanks for visiting! You are very welcome! Thanks for visiting! I just changed my fees. Thanks for this helpful tip. However I was advised that there would be only one rate applied to all of my sales regardless of the transaction now. I will monitor my sales and decide if I should switch the fee back, but for now this is perfect for me. So happy to hear you made the switch!! In order to get auto-adjusting fees you have to hire someone to set your paypal settings to EXPRESS. Unfortunately paypal does not offer to do that. I’m in the process of writing my first few patterns and looking at the best way to sell them. Thanks so much for sharing this information! Every little bit helps when your business is just getting started! So good to know! Thanks for the information! You are very welcome! Thanks for checking it out!